In Europe, the number of lakes with low phosphorus content and greater transparency is increasing, which is the result of measures taken to reduce pollution in their catchment areas. Compared to the 70s, improvement has been observed in Lake Bled since the introduction of remediation measures. As a result, the lake is again classified as moderately burdened and mesotrophic. However, excessive concentrations of phosphorous compounds are still occasionally present, which are reflected in increased phytoplankton biomass and reduced transparency of the lake. Lake Bohinj is one of the oligotrophic, flow-through alpine lakes where human impacts in the catchment area, encompassing a sparsely populated mountain karst area, are relatively mild. The concentration of phosphorous is relatively low, resulting in low productivity of phytoplankton. In the artificial reservoirs, especially those in central and north-eastern Slovenia, where agriculture is the main activity, the average content of phosphorus is significantly higher and transparency lower than in natural lakes, with no trend of improvement. Phosphorus is an indispensible biogenic element. Together with other environmental factors, it regulates biological production in temperate-zone lakes. Phosphorus is a limiting nutrient in lakes. The productivity of the primary producers in lakes is limited, held in check, by the amount of available phosphorus. The addition of phosphorus that is normally in limited supply allows for maximal plant growth. Normally, because phosphorus availability is limited in the phosphorus cycle, plant growth in lakes is also limited. A major problem with the use of phosphorus in fertilizers is the process of artificial eutrophication. Eutrophication is a large increase in the primary productivity of a lake. Annual average of the total phosphorous content in water is used as an indicator of trophic state of lakes. An increased content of phosphorous accelerates the productivity of phytoplankton in lakes. When phytoplankton reaches excessive levels, it can reduce transparency of lakes. Transparency, which is measured by using a Secchi disk and expressed as Secchi depth, is used as a secondary indicator of trophic state. · · To attain good status of waters by 2015. Before the installation of an artificial outlet (1980/81) and partial remediation of the sewage system (1985), the average annual phosphorous concentration was 73 μg P/L. In the same period, the average annual transparency was only 4.3 metres. Immediately after the outlet was put into use, the phosphorous content began decreasing. In the recent decade, the average annual phosphorous concentration is 12.6 μg P/L, while the average transparency increased to 6.7 metres. The lowest and highest average annual phosphorous concentrations in the recent decade were 10 and 16 μg P/L, respectively. Average transparency varies between 8.3 and 4.45 metres, which means that occasionally, phosphorous input to Lake Bled is excessive, resulting in increased phytoplankton production. As phosphorous content is checked only four times a year, the state of phytoplankton is a more relevant indicator of trophic state. In accordance with Water Directive (2000/60/ES) requirements, the ecological state of Lake Bled was assessed as moderate in the period 2009–2014. Aside from Lake Bled, Lake Bohinj is the only permanent natural substantially sized lake (>0.5 km2) in Slovenia. It is an oligotrophic, flow-through Alpine lake, where the effects of man of the lake’s water basin, covering a sparsely populated mountain karst area, are relatively mild. The phosphorous concentration remains relatively low and has not been increasing significantly. Compared to preceding years, transparency was slightly lower (8.8 metres). However, this was a consequence of seasonal fluctuations caused by weather and hydrological conditions and, therefore, didn’t reflect a deteriorating trend. Also, based on the state of phytoplankton, the ecological state of Lake Bohinj has been assessed as very good. Nevertheless, we must bear in mind that pressures on Lake Bohinj are increasing due to constant tourism development. Preventive measures that include thoughtful, sustainable spatial planning and moderate development of the shoreline are of crucial importance for Lake Bohinj. In Slovenia, the highest content of phosphorous can be found in artificial reservoirs, especially those in the northeast, where intensive agriculture predominates and sewage and wastewater treatment systems have not been entirely established. Water in both Pernica lakes, as well as in lakes Ledava and Gajševci, has the highest phosphorous content, with average annual concentrations often exceeding 100 μg/l. In addition to intensive agriculture, fishing and aquaculture represent an important source of nutrients and phosphorous. As the transition from intensive to sustainable farming is a long-term process, no reduction in phosphorous content has been observed so far. Transparency is very low as well, rarely exceeding 1 metre. Reservoirs in the Adriatic watershed (Klivnik and Molja in the Reka Basin in the Brkini region and Vogršček in the Vipava Valley) are less burdened with phosphorous than reservoirs in northeastern Slovenia. All three are mesotrophic water bodies with moderate nutrient load with an average phosphorous content between 12 and 20 µg/l. The average transparency of these reservoirs is 2–3 metres. Fluctuations in phosphorous content and transparency are a consequence of specific hydrological and weather conditions before sampling. Velenje and Družmirje lakes are subsidence lakes that formed when abandoned sections of the Velenje lignite subsided and were inundated. 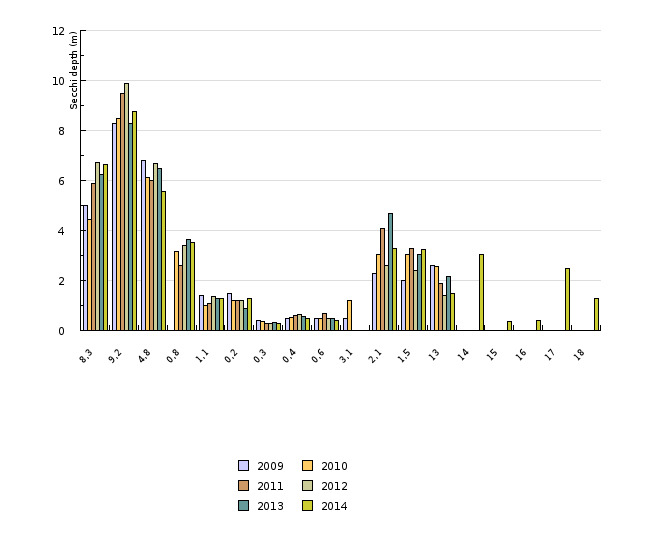 In 2013, the average phosphorous content in Lake Velenje was 60 μg/l, which was above the average of the last 5 years. 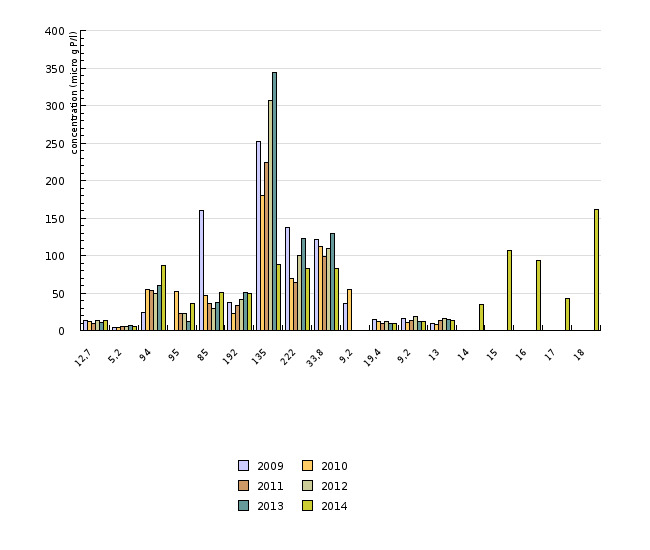 Nevertheless, phytoplankton production was lower than expected and transparency was relatively high – 5.6 metres in 2014. Phosphorous content in Lake Družmirje has been varying markedly. The average annual phosphorous content in the period 2010–2014 was as follows: 50 μg/l in 2010, 23 μg/l in 2011 and 2012, 12 μg/l in 2013 and 36.4 μg/l in 2014. Average transparency in 2014 was 3.4 metres. In 2014, lakes Pernica 1, Pristava and Medvedce (in north-eastern Slovenia), Vogršček 1 (in the Vipava Valley) and Škale (near Velenje) were also included in the lake monitoring programme. Phosphorous content was highest in northeastern reservoirs (average annual concentration 162–93 μg P/l). The concentration in the Vogršček 1 reservoir was 35 μg P/l and 43 μg P/l in the Škale reservoir.